A beautiful full-color field guide to the birds in Rocky Mountain National Park, this book features the bird photography of Estes Park, Colorado, photographer Richard H. Hahn, as well as Hahn's detailed field notes about the birds he has spent decades observing. The book features over 40 migrant and resident birds commonly seen in RMNP. For each bird, Hahn offers a full-page color photograph. On the facing page, he details the time of year and habitat in which that bird is most commonly sighted in RMNP, as well as two specific, easily accessible RMNP locations that will most likely afford a glimpse of that species. He then offers his field observations of that bird in the national park, including relevant historical and cultural connections. 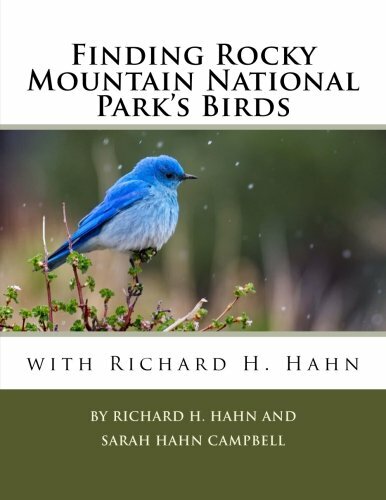 Written with his daughter, Sarah Hahn Campbell, this showcase of Hahn's detailed observations of the birds of Colorado's most popular national park will prove as indispensable to Rocky Mountain National Park visitors as a pair of binoculars, a camera, and a map. This field guide is available from Amazon. However, if you want a signed, personalized edition, you may buy a book from our "shop" page.